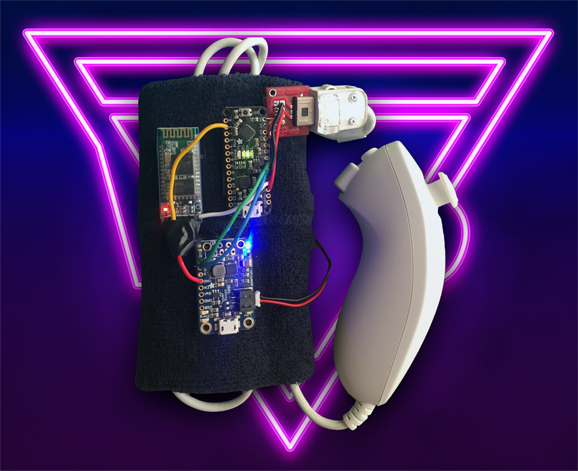 Power Glove Ultra is an hacking experiment done in 2016 for a virtual reality controller based on the NES Power Glove© using the open source platform Arduino. The original Power Glove (1989) was extremely cool but it did not make it as expected due to technological limitations of the period. It was very imprecise, it required ultrasonic sensors fixed to the TV in order to work and it was wired. Moreover, few games were released and the platform got mostly forgotten by the industry over a short time. 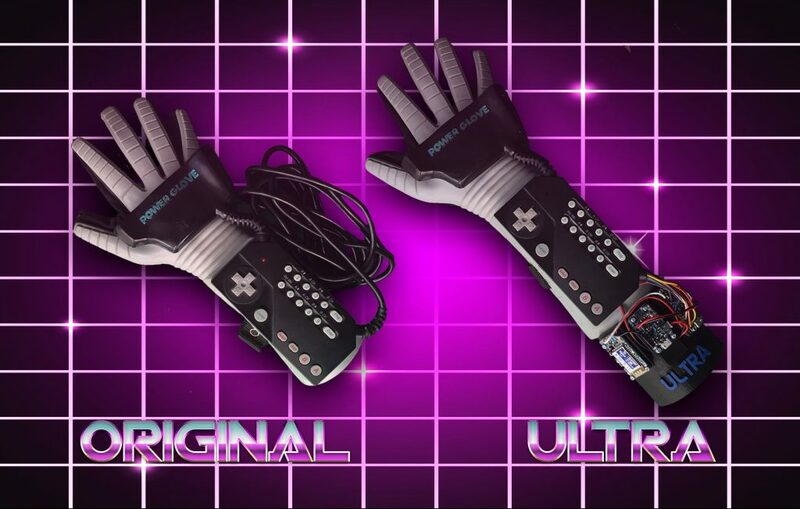 However, the Power Glove retained his role in cyberculture and movies, so that his iconic imagery survived until now. 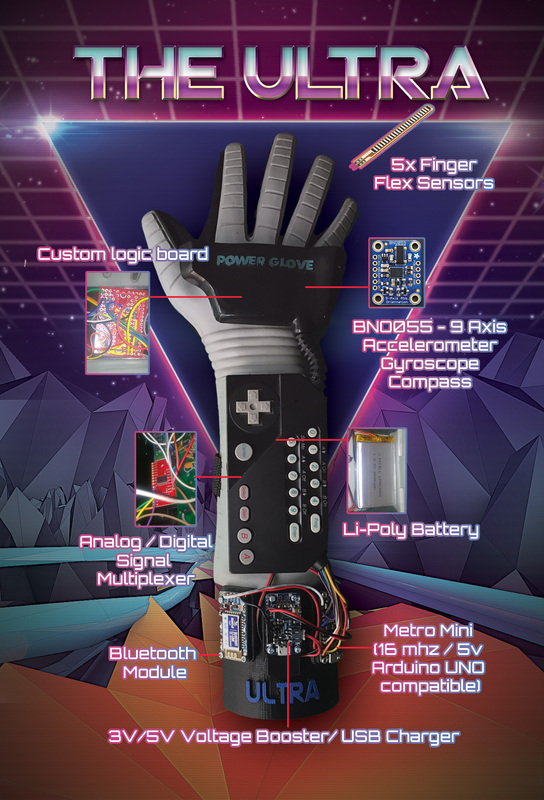 The Power Glove Ultra project aims to give dignity to the original hardware, bringing it into the future by making it possible for it to send 360 degrees arm position data, track the finger movements, and adds compatibility with modern platforms without wires and extra hardware. and of course, it's so bad! For more details about the hardware used, please check this page. The left arm can be used for additional devices, for example the Nunchuck Ultra adapter. This accessory is held by a tennis band on the wrist, and consists of an analog joystick with 2 buttons. The Nunchuck itself has a built-in 3-axis accelerometer sensor LIS3L02AL of ST Microelectronics that can be used in conjuction with the glove fusion sensor. It includes a 10-bit A/D converter and the analog stick. It also communicates over Bluetooth and can even be used as a stand-alone device. You can see it in action in the video page. The Power Glove Ultra is compatible with Windows, Mac Os X, Commodore 64 and Vectrex systems. Compatibility with Commodore and Vectrex machines is obtained through an adapter still in development.